Okay, before the "you're at White Spot again???" comments come flying my way, you need to understand why I am here. Just like when I was a little one, my son loves White Spot. He may not "love" the food per se; but he really digs the gold coin in the Pirate Pak. Yah, call it what you want, but anything that provokes any form of interest in eating is good enough for me. So for his birthday, we asked him where he wanted to go and yes, it was White Spot. Just like I've said many times, I am thankful he is not enamored with ABC, Ricky's or the Pantry. Despite some of its questionable "featured" items, I love White Spot. I grew up on it. There is something about being familiar with the Legendary Burger, Chicken Pot Pie and the beloved Pirate Pak. For people who did not grow up with White Spot, it can be admittedly confusing. Since I've already done 2 separate posts on the North Road White Spot and Lougheed & Gilmore locations, I thought for my visit to the Kingsway location in Burnaby, we'd order some different items. Specifically, for myself, I wanted to try one of their dishes "inspired" by local celebrity chefs. Furthermore, since they are currently promoting their Bella Italia menu inspired by Pino Postero, we got some items off that menu as well. 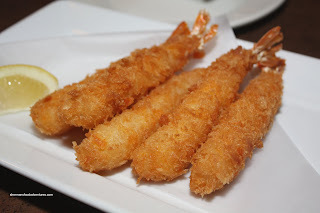 We started with one of their most popular appetizers - Nobashi Shrimp. Similar to shrimp tempura; but with a panko coating, these are actually quite good. I'd prefer that they would use some sort of chili mayo dip rather than the ho-hum bottled sweet chili sauce. But, the shrimp were a good size and the coating was crisp. For our second appetizer, we went for something that is new on the menu. A little on the expensive end of the scale, we got 3 Bacon & Cheese Sliders for $10.00. 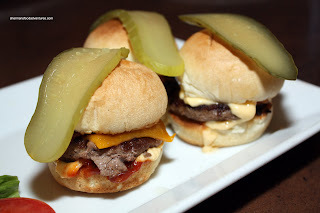 Little more than mini-versions of their popular burgers, these were a nice little bite for those not wanting to eat a full-sized burger. Laced with an obscene amount of mayo and Triple-O sauce, these sliders exhibit the same messy quality as their bigger cousins. For my main, I ventured off the standard burger path and went for the Chicken Curry inspired by John Bishop. I'm not really sure what curry and John Bishop have in common; but it was $14.00, I guess he inspired the price then. Although the components of the dish itself were not bad, there is no mistaking that it is a watered-down curry meant for non-curry eaters. One particular component was quite perplexing. The 2 pieces of "naan" resembled grilled pita bread than anything. Not bad to eat; but it ain't naan. 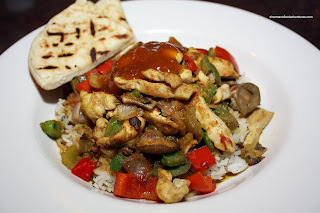 There were lots of red and green peppers, onions and chicken; yet unlike a real curry, the peppers were quite crunchy. I didn't necessarily dislike the curry per se, it just wasn't what I'm used to eating (especially since I eat at Indian restaurants in Surrey). Viv went for one of the features in the Bella Italia menu which was the Roma Burger. 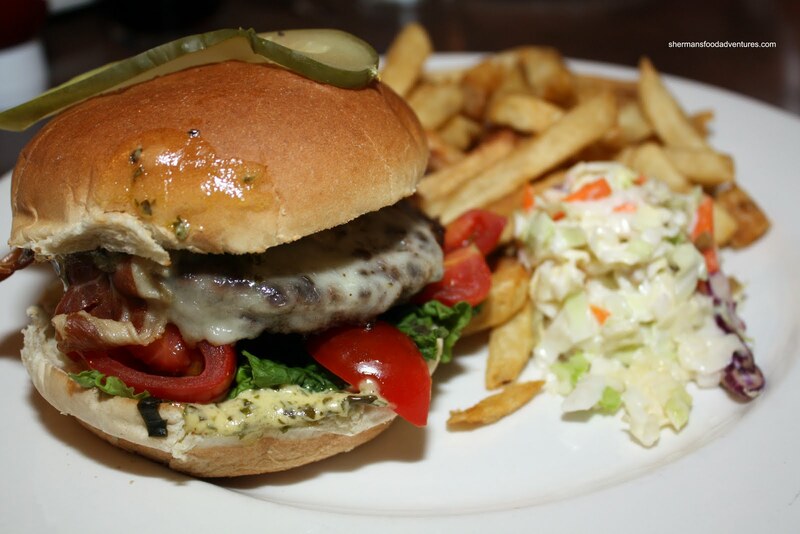 As described on the menu - it's a 6oz beef burger with crispy baked prosciutto, vine-ripened Amorosa tomato basil salsa, provolone cheese and basil aioli. Since we already like the burgers at White Spot, it was not a stretch for Viv to like this one too. With the beef still pink and the burger stuffed with so many ingredients, it was a messy; yet tasty eat. The only thing was that the tomatoes in the salsa were cut too big making it hard to eat and keep within the bun. 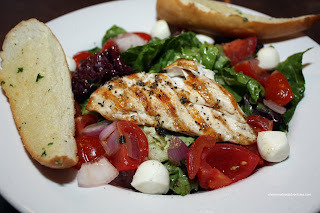 My dad chose the Caprese Chicken Salad which is also on the featured menu. Well, it is a salad and as you can see, everything is fresh. However, the re was a lack of dressing and the chicken was pathetically thin and small. Predictably, my mom had the CBC or Chicken, Broccoli and Cheese. That's her favourite dish here and it's not often she strays from it. 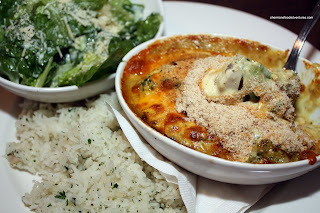 It's essentially a baked light curry cream sauce consisting of chicken, broccoli and cheese. If you like food in creamy sauces, this one is for you. Of course we wouldn't even be at White Spot if it weren't for the birthday boy. My son likes the Pirate Pak and honestly, I'm not even sure if he really cares about the food. He keeps talking about the chocolate coin... Whatever the case, he got the Mac 'n Cheese while my daughter got the Cheeseburger. Both come with fries, beverage, ice cream and the precious chocolate coin. It's all served in a paper vessel (literally) that resembles a pirate ship. Brings back memories for myself and Viv for sure. In terms of service, it was efficient and attentive despite being quite busy. Once again, this visit to White Spot proves that the ol' standbys (burgers) are solid. But those featured items inspired by local celebrity chefs are hit and miss. 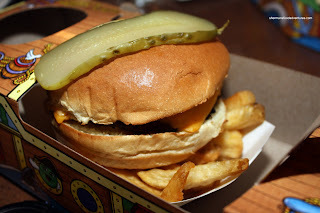 As for me, I did not grow up going to White Spot so part of the Pirate Pak experience is missing for me. (On that note, Mijune is running a Triple O's draw). I think we have talked about this a couple of times - White Spot expanded their menu to entice more people to go to their restaurants. After all, not everybody want to eat burgers... Of course, their degree of sucess is, as you mentioned, hit or miss. That's why, if I go to their restaurants, I have low expectations if I order anything aside from their burgers. But, having said that, their "designer" burgers are quite decent. Kim - do the sliders come with the cole slaw or fries like the regular burgers, or are they separate ? Are the smaller beef patties same-tasting as their larger cousins ? That would be a good addition from a family standpoint, if my kid can eat one slider (2 at the most) instead of going for the Pirate Pack options which I feel are a bit of a rip-off. LR - the sliders came as is with only 3 of them. It is not really worth the $10.00. But they are good and taste exactly the same as the regular ones. And as you said, great for kiddies who can't eat a big one. white spot is familiar for many people. i like their yam fries and not much else. i wish their menu would include more seafood options - like the cactus club and their tuna tataki. but they always seem to be busy so they must be doing something right! @ Trisha - I think WS's core market hasn't really changed that much. Even us as new parents of one 4-yr old, we try to *avoid* WS because the offerings for the adults leave a lot to be desired, for us at least. Maybe we are atypical and don't fit their target market profile (we have a much better time eating as a family at say Congee Noodle House or a greasy spoon diner, ie: Bert's). So yeah, WS is definitely doing something right to their own loyal customer base (and the odd first-times who got duped in, LOL). We joke that WS isn't kidding in their use of the word "white", LOL. I love white spot, I hate Nobashi Shrimp. How much batter do you need for the shrimp? My wife likes them, but I can't stand the soggy dough that always seems to be around the shrimp. Tempura shrimp please. To me, White Spot exists for burgers. They keep trying to bring in new clients with silly new offerings, but that is just there to appease those who demand something different rather than consistency. Every time I go to a white spot, the cooks are being yelled at for screwing up some how. I always wonder where the fault lies. LOL nitroburn! My wife hates the shrimp too, stating exactly what you said... Haha.. I don't mind them. Yes, please White Spot, don't come up with these dishes that the cooks cannot execute properly or consistently. Stick with what works. Well as you can prolly tell by now my love for WS runs deep. 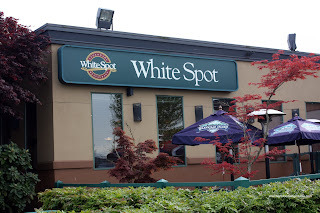 I'm a Houston Foodie who's spent time in Vancouver and me and my kids love White Spot too. I've found that ordering sauces like the Triple-O or Mayo on the side tends to take care of some of those issues. My son really loves the pirate pak as well.